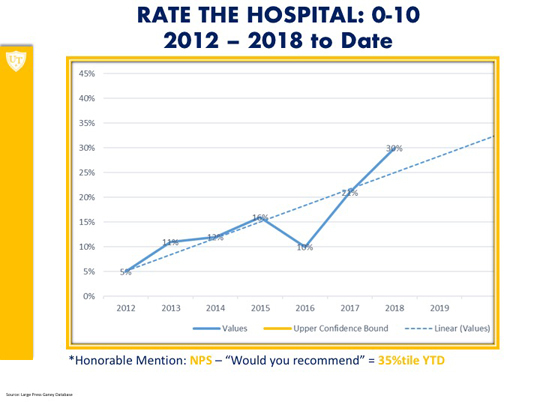 When asked to rank the hospital on a scale of one to 10, UTMC has reached the 30th percentile nationally. UTMC also is in the 36th percentile for patients “highly recommending” the hospital. The survey scores are an indicator of patient perspectives about the hospital and are used as a quality measurement by the Center for Medicare Services; the scores influence the hospital’s reimbursement rate from the center. Staff and physicians continue to ensure patients and their families have an excellent experience when they trust UTMC with their health and healing. The hospital receives monthly reports on the Hospital Consumer Assessment of Healthcare Providers and Systems scores through Press Ganey, an independent third-party survey administrator. That data will be shared monthly in the electronic UTMC newsletter so that employees can see how their efforts are contributing to the hospital’s success. This entry was posted on Friday, June 15th, 2018 at 2:04 am and is filed under UTMC, UToday .